American naval officer; born in Philadelphia April 22, 1792; died in New York March 22, 1862. Levy was a cabin-boy before the age of eleven; he was apprenticed as a sailor in 1806; in 1810 he became second mate of a brig, and later first mate of another. He purchased a one-third interest in the schooner "George Washington," of which he was master until 1812. On Oct. 23, 1812, he received a commission as sailingmaster in the United States navy, serving on the ship "Alert," and later on the brig "Argus," bound for France. The "Argus" captured several prizes, and Levy was placed in command of one, butthe prize was recaptured by the English, and Levy and the crew were kept as prisoners in England for sixteen months. In 1816 he was assigned as sailingmaster to the "Franklin," 74 guns, and in March, 1817, he was appointed lieutenant, his appointment being confirmed by the Senate. Levy had many difficulties in the navy, possibly due to anti-Jewish prejudice. He fought a duel, killed his opponent, was court-martialed six times, and finally dropped from the list as captain, to which rank he had been promoted. He defended his conduct before a court of inquiry in 1855, was restored to the navy as captain, and subsequently rose to the rank of commodore. 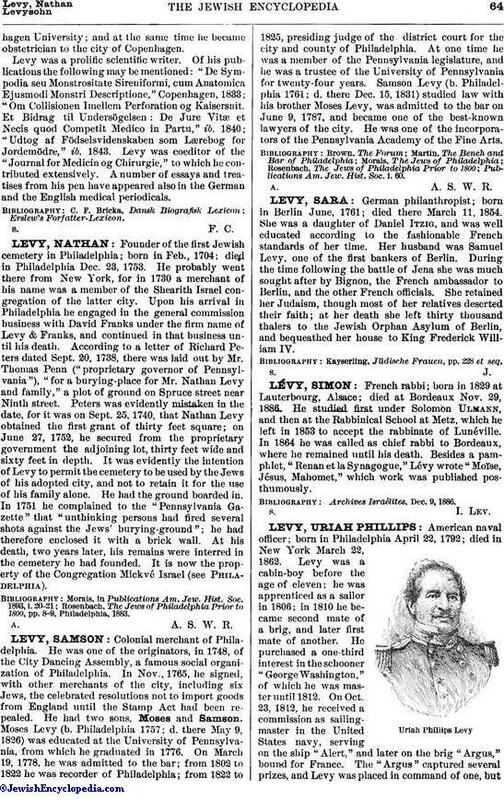 Levy always acknowledged his Jewish allegiance. He was a great admirer of Thomas Jefferson; he purchased Monticello, the home of Jefferson (still owned by Levy's descendants), and presented to the United States government a statue of Jefferson, which is now in the Capitol at Washington. The freedom of the city of New York was voted to him by the common council on Feb. 6, 1834, as a testimonial to his character, patriotism, and public spirit. 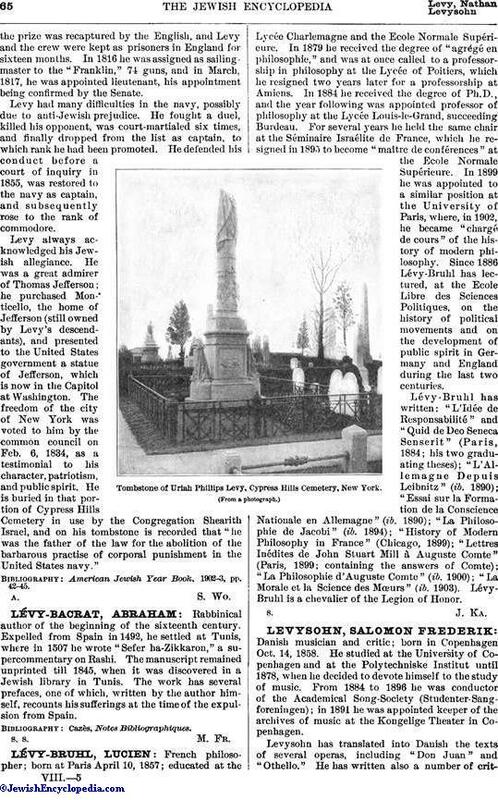 He is buried in that portion of Cypress Hills Cemetery in use by the Congregation Shearith Israel, and on his tombstone is recorded that "he was the father of the law for the abolition of the barbarous practise of corporal punishment in the United States navy." American Jewish Year Book, 1902-3, pp. 42-45.